Allergen Statement: Contains soy and almonds. May contain other tree nuts and traces of milk. May contain nutshell fragments. We do not source genetically modified ingredients. Protein grain blend (soy protein isolate, organic rolled oats, organic rice flour, organic roasted soybeans, organic soy flour, organic milled flaxseed), organic brown rice syrup, organic dried cane syrup chicory fiber syrup, vegetable glycerin, organic high oleic sunflower oil, organic palm kernel solids, organic almonds, palm kernel oil‡, organic apple powder, organic soy flour, organic blueberry juice concentrate, dried blueberries, apple juice concentrate, organic corn starch, natural flavors, water, organic soy lecithin, organic tapioca maltodextrin, citric acid, organic natural flavors, sea salt, pectin, red cabbage extract (for color), mixed tocopherols (antioxidant). Protein grain blend (crisps [soy protein isolate, organic rice flour, organic alkalized cocoa], organic roasted soybeans, organic soy flour, organic milled flaxseed), organic brown rice syrup, organic dried cane syrup, walnuts, vegetable glycerin, organic cocoa, organic high oleic sunflower oil, chicory fiber syrup, organic palm kernel solids, organic cocoa butter, organic unsweetened chocolate, palm kernel oil, water, organic cane syrup, organic alkalized cocoa, natural flavors, organic natural flavors, sea salt, organic soy protein concentrate, organic soy lecithin, mixed tocopherols (antioxidant). Allergen Statement: Contains soy and walnuts. May contain traces of milk. May contain nutshell fragments. We do not source genetically modified ingredients. Protein gain blend (crisps [soy protein isolate, organic rice flour, organic alkalized cocoa], organic soy flour, organic roasted soybeans, organic milled flaxseed), organic brown rice syrup, organic dried can syrup, organic cane syrup, organic high oleic sunflower oil, organic cocoa, vegetable glycerin, chicory fiber syrup, organic alkalized cocoa, chicory fiber, organic soy flour, organic unsweetened chocolate, organic cashew butter, palm kernel oil, organic palm kernel solids, natural flavors, organic gym arabic, organic soy lecithin, sea salt, organic vanilla extra, organic cocoa butter, soy lecithin, mixed tocopherols (antioxidant). Protein grain blend (organic rolled oats, soy protein isolate, organic rice flour, organic roasted soybeans, organic soy flour), organic brown rice syrup, organic cane sugar, chicory fiber syrup, organic virgin coconut oil, vegetable glycerin, organic high oleic sunflower oil, organic cane syrup, organic cocoa, organic palm kernel solids, palm kernel oil, organic coconut, sea salt, natural flavors, soy lecithin. Allergen Statement: Contains soy. May contain peanuts, tree nuts, and traces of milk. We do not source genetically modified ingredients. Protein grain blend (soy protein isolate, organic rolled oats, organic rice flour, organic roasted soybeans, organic soy flour, organic milled flaxseed), organic brown rice syrup, organic dried cane syrup chicory fiber syrup, vegetable glycerin, organic high oleic sunflower oil, organic cocoa, palm kernel oil‡, organic unsweetened chocolate, organic palm kernel solids, organic rice flour, organic soy flour, dried cane syrup, sunflower oil, tapioca starch, alkalized cocoa‡, natural flavors, organic soy lecithin, salt, organic vanilla extract, unsweetened chocolate‡, soy lecithin, baking soda, beet powder (for color). May contain traces of various nuts. In keeping with this tradition, we use only non-GMO soy products, meaning that none of the soy in Clif Bar products has been genetically modified. Allergen Statement: Contains soy and almonds. May contain other tree nuts and traces of milk. We do not source genetically modified ingredients. Protein Grain Blend (Soy Protein Isolate, Organic Rolled Oats, Organic Rice Flour, Organic Roasted Soybeans, Organic Soy Flour, Organic Milled Flaxseed), Organic Brown Rice Syrup, Organic Dried Cane Syrup, Organic Peanut Butter, Vegetable Glycerin, Inulin (Chicory Extract), Organic Sunflower Oil, Organic Peanuts, Organic Peanut Flour, Organic Cocoa, Palm Kernel Oil, Organic Palm Kernel Solids, Natural Flavors, Sea Salt, Organic Soy Lecithin, Organic Vanilla Extract, Mixed Tocopherols (Antioxidant). LunaProTM (soy rice crisp [soy protein isolate, rice flour], organic toasted oats, organic roasted soybeans, organic soy flour, organic milled flaxseed), brown rice syrup, coating (organic evaporated cane juice, palm kernel oil, soy flour, inulin, soy lecithin, natural flavors) vegetable glycerin, inulin, rice flour, natural flavors, ginger black tea leaves, sea salt, cinnamon, cloves, cardamom, green tea extract. dicalcium phosphate, magnesium oxide, calcium carbonate, ascorbic acid (Vit. C), tocopheryl acetate (Vit. E), niacinamide (Vit. B3), ferrous fumarate (Iron), zinc oxide, molybdenum glycinate, calcium pantothenate, pyridoxine (Vit B6), riboflavin (Vit. B2), beat carotene (Vit. A), thiamin (Vit. B1), manganese sulfate, selenium ACC, cupric oxide, chromium AAC, cyanocobalamin (Vit. B12), folic acid, biotin, phytonadione (Vit. K), potassium iodide. Contains Soy, Almonds and Coconut. May contain traces of dairy, peanuts, wheat, and other tree nuts. No hydrogenated oils. We source ingredients that are not genetically engineered. 70% organic ingredients. Protein grain blend (soy protein isolate, organic rolled oats, organic rice flour, organic roasted soybeans, organic soy flour, organic milled flaxseed), organic brown rice syrup, organic dried cane syrup, organic high oleic sunflower oil, chicory fiber syrup, vegetable glycerin, organic cocoa, palm kernel oil‡, organic palm kernel solids, natural flavors, rice flour, organic soy lecithin, cocoa butter‡, sea salt, organic vanilla extract, fructose, chicory fiber, soy lecithin, gum arabic. Allergen Statement:Contains soy. May contain traces of milk. We do not source genetically modified ingredients. LunaPro (soy rice crisp, (soy protein isolate, organic rice flour), organic toasted oats (organic oats, organic evaporated cane juice), organic palm kernel oil, organic soy flour, organic soy lecithin, organic vanilla), organic dry roasted almonds, inulin (chicory extract), almond butter, dry roasted almonds, organic oat syrup solids, vegetable glycerin, organic sunflower oil, sea salt, organic flavors. LunaPro (Soy Rice Crisps Soy Protein Isolate, Organic Rice Flour], Organic Toasted Oats [Organic Rolled Oats, Organic Dried Cane Syrup], Organic Roasted Soybeans, Organic Soy Flour, Organic Flaxmeal), Organic Brown Rice Syrup, Coating (Organic Dried Cane Syrup, Palm Kernel Oil, Organic Palm Kernel Oil, Organic Soy Flour, Organic Soy Lecithin, Organic Vanilla), Organic Macadamia Nuts, Inulin (Chicory Extract), Organic Macadamia Nut Butter, Vegetable Glycerin, Organic Oat Syrup Solids, Organic Sunflower Oil, Sea Salt, Natural Flavors, Organic Natural Flavor. Many women fail to get adequate vitamins and minerals on a daily basis. LUNA bar was created to help women get more of the nutrients often lacking in their meal plans while being 100% natural and as organic as possible. That´s why LUNA bar contains ingredients, like folic acid (for healthy babies and mothers-to-be), soy protein (for a healthy heart), calcium (for strong bones), and 23 vitamins and minerals that are essential to a woman´s everyday nutritional needs. As women ourselves, we understand the importance of maintaining overall health and wellness. 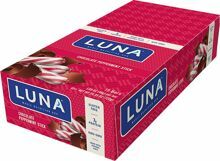 LUNA was the first bar specifically formulated with a woman´s needs in mind. In just 180 calories, LUNA is entirely natural and 70% organic and meets many of the specific nutritional requirements women need to maintain active healthy lifestyles. 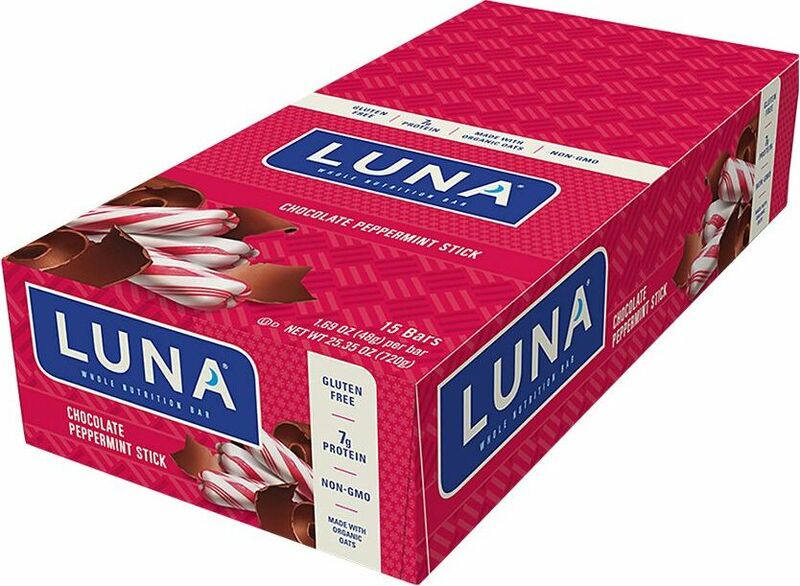 LUNA bars also have no artificial sweeteners, no high fructose corn syrup and no trans fats.